Tim's first meeting with Jim Shooter was when the Marvel US editor in chief had visited the Marvel UK Bullpen in 1987. Tim had attended a seminar in comics, along with many if the UK bullpen of the time, given by Jim Shooter, in his drive to standardise his theories on successful comics creation. It wasn't until March of 1993 that the two would meet up again, when the ex-editor in chief (by this time) along with Janet Jackson the ex-designer/colourist also from Marvel comics' fame attended a comics convention in Glasgow. It was pure chance that Tim decided to have a coffee with a couple of friends following the slowing down of the convention late on the Sunday afternoon in the hotel restaurant/bar area. 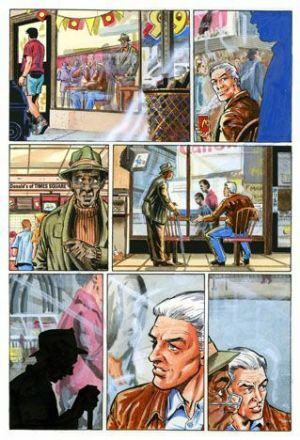 It was even more fortuitous that Jim Shooter and Janet Jackson should then sit across from them on the opposite table. Tim reintroduced himself and after showing his portfolio of work to them both was hired on the spot to paint a new comic in production by the legendary Steve Ditko of Spider-Man and Dr. Strange fame. During the next few of months whilst working on Marvel UK's new American styled comics under the guidance of editor, Paul Neary, producing full colour art on a 2000AD future shock, producing a story for DC comics editor, Andrew Helfer for his Big Book of Death digest sized book and a couple of Tiny Toons comics for Warner Bros. c/o DC comics Tim worked on a series of cards drawn by both Steve Ditko and newcomer Joe James for the Dark Dominion card set. In August of 1993 Tim set out for New York and the land of comic books. During his time there Tim worked on a variety of comic books. (Please see the Tim Perkins Career to Date page to learn more) as firstly a painter and then as a penciller and inker filling in as an all round artist wherever he could. Tim's main book was Dark Dominion, pencilled firstly by Joe James and inked by a variety of inkers such as Bob Downs, Charles Yoakam, Steve Leialoha and Mike Witherby. The second penciller, was a fill-in artist and also a fellow Brit, Charlie Adlard, however Tim skipped this issue to fill-in on a number of other titles to try and pull back late deadlines. The third artist was Louis Small Jr. with inks by Mike Barreiro and Bob Downs. 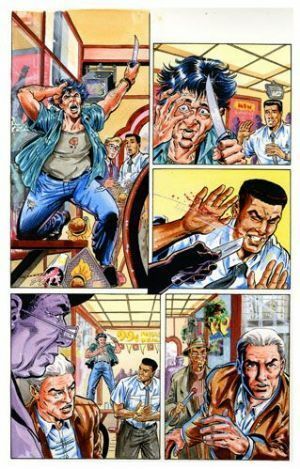 The fourth artist was Jeff G. Jones with inks by Mike Barreiro and the final artist to work on the book was John Ridgway. Su McTeigue painted the last two issues #9 and #10. Throughout the book's life the general comments from fans of the book, towards Tim's work, was one of consistency, despite a multitude of artists. The book was completely different in look due to Tim's painting. 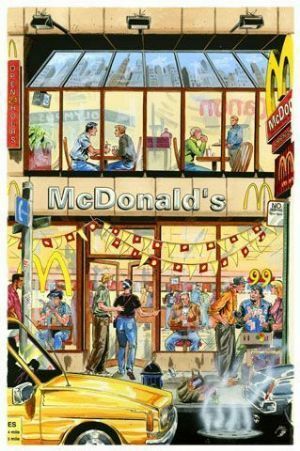 Alan Weiss was over the moon when Tim painted pages from a sunset scene in his War Dancer comic, telling him that he had been impressed with his painting technique from the very first page of Dark Dominion issue #1's splash page with a scene looking into a McDonalds restaurant with the reflections of New York city's skyscrapers in the windows as the reader looks into it. Tim painted Dark Dominion using acrylic paints, in his totally unique style, whereas with the other books he "ghosted" or emulated Colour Editor, Janet Jackson's established house style. The main storyline behind dark Dominion is Quantum Theory. The story takes place in modern day Manhattan and the Quantum Realm. The idea is that creatures dwelling in that realm can pass into our realm feeding on fear, greed and all the other myriad vices and evils that are a part of the human race, manipulating these fears within each of us, as they do so. Michael Alexander nicknamed 'The Glimmer', a guy getting on in years, can pass between both our world and that of the Quantum creatures. He is hardly the likely hero but fights the Quantum creatures lead by the lead villain Chasm. The painting style Tim employed was similar to that used in his 2000AD work on series like Chopper, Universal Soldier and Shadows. Acrylics over black-line work printed onto watercolour paper. 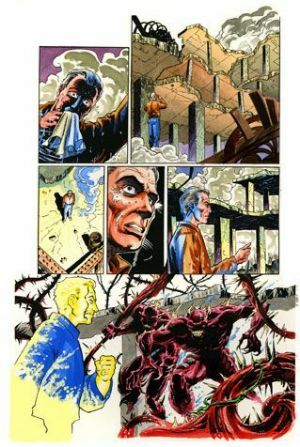 2000AD had used 'Kentmere paper', whereas Defiant used a technique Tim had already used for his own work and that of several other companies, using 'Saunders Waterford 90lb Hot Pressed paper'. 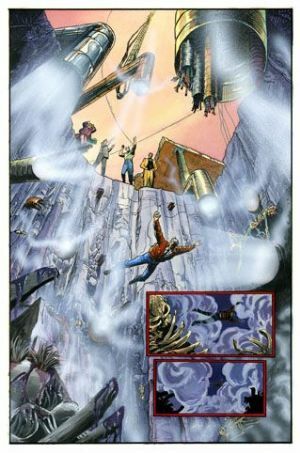 The Acrylics were built up in layers until the right textures and saturation was reached for the pages to be complete. Defiant became part of the huge comics implosion during 1994 and closed its doors for the final time later in the year around September time. "It was a real shame. I still feel bad for Jim (Shooter). He showed me how comics companies could be and should be run. There was an actual bullpen where some really talented creators, both writers and artists worked daily, burning the candle at both ends. It was a great experience for me and one, which I will never forget!" "Jim treated everyone at Defiant with great respect and honour and I feel privileged to have been able to be a part of something so good, if only for a short while." Examples of the colour work can be seen below. These have been scanned from the original artwork.